Minnesota Democrat Congressman Keith Ellison, who also serves as the DNC's Deputy Chairman, posted a photo Wednesday night proudly displaying an Antifa handbook and warning Donald Trump about its use. As a reminder, Antifa is a leftist agitator organization whose members advocate violence for the sake of political gain. They are hardly the "anti-fascists" they claim to be. Federal domestic terrorism investigators are probing “a number of” people animated by “kind of an Antifa ideology,” FBI Director Christopher Wray told lawmakers Thursday. Ellison is no stranger to embracing violence. In 2008 he met with the president of a bank footing the billfor Palestinian suicide bombers and their families. Ellison, now a leading candidate to head the Democratic National Committee, was brought to Saudi Arabia for a two-week trip by the Muslim American Society (MAS), a group founded by members of the Muslim Brotherhood to act as its "overt arm" in the United States. 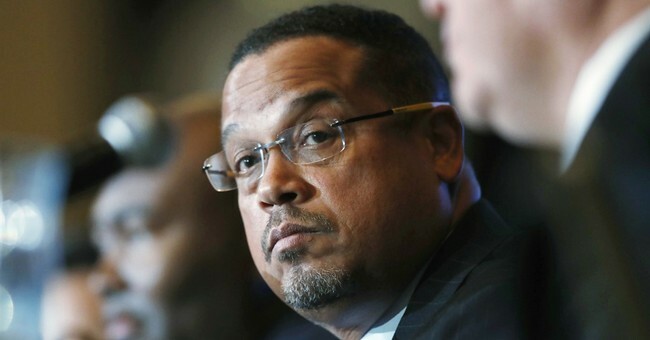 Ellison also took time on his trip to meet with Dr. Ahmad Mohamed Ali, the president of a Saudi Arabia-based bank that funnels millions of dollars to the families of Palestinian suicide bombers in Israel. Ali's bank, the Islamic Development Bank, maintains the Al-Quds Intifada Fund and the Al-Aqsa Fund, which were established in 2000 to fund Palestinian terrorism and provide money to the families of Palestinian "martyrs." The funds were established with an initial investment of $200 million. No word yet on whether the DNC as a whole endorses the Antifa movement, but given Ellison's high profile run for chairman last year, we have a clue.